Today’s article is the first of two parts on the growth of Newark Public Library as it marks its 110th year. In previous months in this column, we have noted that Newark has been the residence of a great number of famous people, the site of many nationally important events, and the home of products sold throughout the country and carried across the world, as well as the source of some important ideas. In the case of librarianship, the Newark library generally has been recognized not only as a librarian’s library but as a 'people’s university' as well. It has had an excellent record for serving as a storehouse for information as well as a depository for society in general. And it has attempted to remain the one place in town where personal eye-to-eye relationships between staff and users have been maintained. The 'You Need Information, We Supply It' syndrome has worked well over the years. As the decades pass, the cast of characters has changed, ideas have emerged or disappeared, innovative services have been developed, and even the forms of information provided have changed radically. Different ethnic communities have risen to power, and Newark has evolved as a service city as well as remaining an industrial and commercial city. Still, the one thing that remains is the knowledge that the library user is somehow a little better off after using the library’s materials, attending its programs, lectures, or exhibitions, or simply finding a friendly environment for work or recreational pursuits. The Newark library is a relatively old institution compared to other American libraries. It has been around for only a third of the city’s lifetime. Robert Treat, the city’s founder, is said to have brought dozens of books with him when he arrived in 1666, including the Bible and other religious tracts. But the best known precursor of today’s modern library was the old Newark Library Association which existed from 1845 to 1889. Its existence was made possible by an 1840s law designed to establish a library with all proper conveniences and appurtenances. The creation of a suitable edifice for its accommodation, with a view to advance the interest of learning generally, and to instruct and better educate the youth of Newark in science, literature, and the arts, was the main mission. Subscribers paid an annual fee of $3. In return, they were allowed to borrow two books at a time. The association’s landmark home, Library Hall, became the center of cultural Newark. It accommodated the library on the first floor, but also gave rooms to the post office, the New Jersey Art Union, the New Jersey Historical Society, the New Jersey Natural History Society, and the YMCA. During the association’s lifetime, it did a lot of good for Newark residents, but it was not free, and many Newarkers of that time were desperately poor. A New Jersey law passed in 1884 allowed for the establishment of a public or free public library. In 1887, the citizens of Newark voted to apply the law and created the Newark Public Library. Here is a synopsis of the first half of the library’s 110-year history. 1888: The Library Board of Trustees was established, and a building on West Park Street was leased for the library's first home. 1889: The new public library opened with a book charge-out system that became nationally known as 'the Newark system.' 1890: Schools began visiting the library with 330,000 books circulated. 1891: The Newark Library received its first out-of-state library school visitors. 1892: The library administration noted that it was 'to strive to gather a library useful to students, interesting to readers, and profitable to all.' 1893: The University Extension Society was organized, and the library's first exhibition of art books opened. 1894: Long-time librarian Beatrice Winser was appointed and a valuable book collection was received from J. Ackerman Coles, including the works of local authors Dr. Thomas Dunn English and Amanda M. Douglas. 1895: Serious consideration was given to a new site and home for the growing library seeming suitable 'on the general principles, that the library should be located in a building owned by the city.' 1896: The statue of 'Benjamin Franklin and His Whistle, ' now located on the third floor, was presented to the library by Dr. A. Coles and his sister. 1897: The library began delivery of books to schools by wagon and to five city firehouses. 1898: Business directories were added to the collections to accommodate the business community and 45 new Polish books were acquired for the foreign language collections. 1899: A cornerstone was laid at the present library building on Jan. 26. Arrangements were made for the installation of 26 telephones in the new building. 1900: New York City publisher Charles Scribner loaned materials for exhibit in the new building. 1901: First Newark librarian Frank Hill officially opened 5 Washington St. Later that year, John Cotton Dana was appointed director and Beatrice Winser his assistant. 1902: Dana, one of America's best-known librarians, was installed as head librarian. Newark's picture collection was begun and interlibrary loans became more frequent. 1903: 32,000 attended a major library art exhibition. Under Dana's administration, a variety of library publications began to appear. 1904: Dana's interest in Newark history resulted in Frank Urquhart's three-volume Newark history. Books for the blind were purchased. 1905: Branch No. 1 (the future Business Library) opened. Five Italian-language newspapers were added for the Italian-speaking community. Branch No. 2 was opened in the Clark Thread Co. Several deposit stations were started at Vailsburg and on Garside Street. 1906: Beginning of the library's U.S. document and U.S. Patent collections, among the largest in the country. 1907: First time the telephone was used as a serious reference tool. Branches opened at Springfield, Roseville, Ironbound and Lafayette. The Schools Department and the Art Department emerged as separate library units. 1908: The library staff came under Civil Service rules. The famous Carteret Book Club was founded at the library under the leadership of Dana. 1910: Art Department moved to the third floor with a large collection of 7,000 books. 1911: 'Made in Newark' index was begun at Business Branch; the first issue of The Newarker published. 1912: A major city planning exhibition was held at the main library with maps, charts and graphs. The library underwent a major equipment upgrade and change. 1913: Springfield Branch became known as the 'Foreign Branch' because of books in Russian, German, Yiddish, Polish, Ruthenian, Italian and Hungarian. The library's vertical files on Newark were transferred to reference from the Schools Department. 1914: A color-coded filing system developed at the library became standard for other American libraries. Dana was invited to serve on the Newark Committee of 100 to celebrate the city's 250th anniversary in 1916. 1915: The High School Branch at Barringer High School was taken over by the Newark Board of Education. An important exhibition on New Jersey clay products opened. 1916: Vice Chancellor Howell left the bulk of his estate to the library for purchase of history and biography materials. A great textile exhibition opened and a second exhibit on printing featuring Bruce Rogers was co-sponsored by the Carteret Book Club. 1917: Newarkers send 41,000 books and 200,000 magazines to servicemen in Europe. 1918: The library worked with wartime organizations in town. All library branches closed during war effort. 1919: Hospital service begun with St. Barnabas. Patrons charged for reference service in excess of 30 minutes. 1920: Circulating prints available to borrowers with 'library-approved frames.' J. Ackerman Coles presented the library with his valuable rare book collection. 1921: Library published book lists on the Far East. Bronze plaque to Stephen Crane affixed to exterior of building. 1922: Plans made for 20,000-square-foot addition to the main library, and to build seven city-owned branches in the next nine years. 1923: Springfield Branch opened at a cost of $68,000; Van Buren Branch completed for $41,000. 1924: Ground broken for the new $750,000 museum building paid for by department store giant Louis Bamberger. 1925: Shigeyoshi Obata, Japanese print and book expert, identified materials in Newark's famed Japanese collection. Clinton Branch opened; library cards issued to non-resident employees of Newark-based companies. 1926: Main Library reading room opened on Sundays; well-known English poems printed on cards sold in packs. 1927: Business Library moved to a city-owned building. Vailsburg Branch opened. Library of Congress director complimented Newark on its map collection. 1928: Business Literature book list published for first time. Branches opened in Bamberger's and Kresge's department stores. 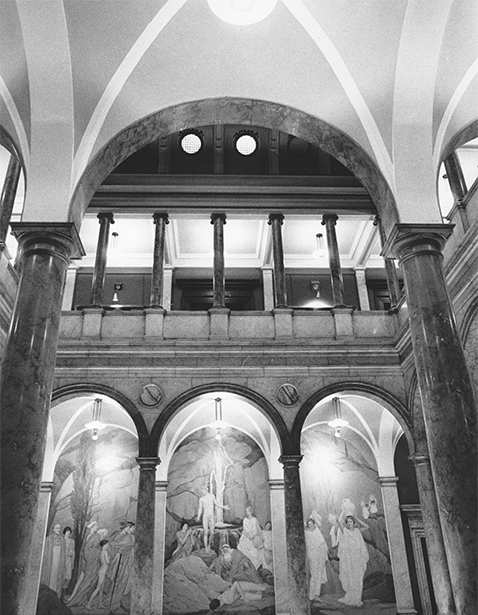 1929: The 'Fountain of Knowledge' mural on library's second floor by Ives Gammell unveiled. Weequahic Branch opened. John Cotton Dana died July 21; Beatrice Winser was appointed librarian. 1930: North End Branch opened. Library's card file of New Jersey authors was started. 1931: Library services offered to patients in City Hospital. Dickman charge-out system was instituted. 1933: The library appropriation was reduced by $150,000 and many services were cut; branches in hospitals, schools and jails closed; many library projects were added under the Emergency Relief Administration. 1934: Additional cuts imposed. 1935: Half the library funding cuts were restored. WPA activities began. 1936: The library took part in the 100th anniversary of the city's incorporation. First salary increases for lowest-paid employees since 1931. 1937: Library appropriation of $560,000 was achieved with a book budget of $97,000.